Despite being very much connected to and associated with all manner of water-based fishing activities, Sea of Thieves didn't have a fishing mode--until now. Coming April 30, players will not only be able to cast a line and reel in a big fish, but players will also be able to cook their catch. 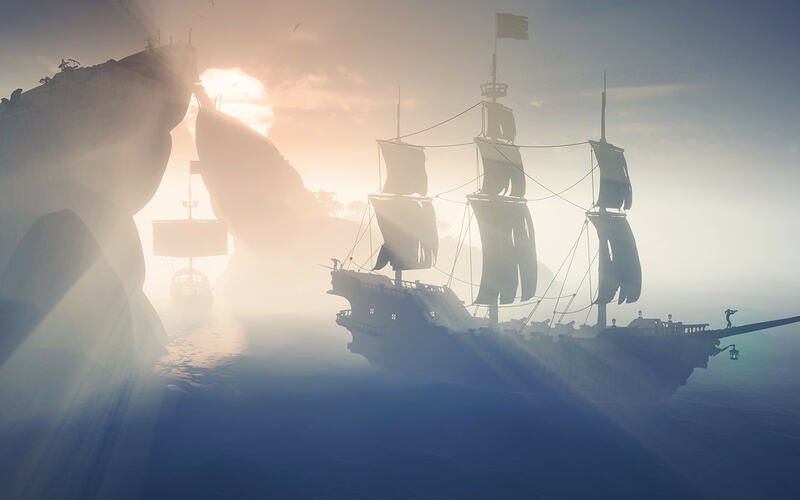 Executive producer Joe Neate from Rare joked that the developer will remove fishing from Sea of Thieves if people don't live up to their word and fish their hearts out. More seriously, the Anniversary update is the biggest content update for Sea of Thieves to date. Fishing comes to the game through the new Hunter's Call Trading Company, which is led by Merrick. In addition to fishing (which you can do from shore or on ship), players can hunt animals and other creatures, and, like fish, cook the flesh for energy. However, some meat may be poisonous. Additionally, players can earn gold and cosmetic rewards for fishing and hunting. The Anniversary Update also adds a new competitive mode, along with a new storyline called Tall Tales: Shores of Gold. "Follow a series of narrative adventures surrounding existing and all-new characters, taking you to undiscovered places and revealing surprising new gameplay features," reads a line from the description. "Fans of the expanded game universe will recognise some of the iconic characters and locations in Shores of Gold, yet this is only the beginning of a series of Tall Tales that will allow players to immerse themselves in the legends of Sea of Thieves." Finally, the Anniversary Update promises a number of improvements to the base game, including a more advanced ship damage system that is capable of damaging specific ship elements. "Expanded ship damage means that your beloved vessel can suffer a broken mast, capstan, or even wheel, meaning that sailing and escaping battle could get very tricky indeed," Rare said. "Meanwhile, the arrival of the harpoon means that treasure can be nabbed by a skilled enemy and ships can make some surprising manoeuvres." Being such a large update, Microsoft will hold a series of livestreams to talk about its different content elements. These will be help on April 10, April 16, and April 23 leading up to the update's release on April 30. You can watch the streams on all the usual places: Mixer, Twitch, and YouTube. The full programming schedule can be seen here as written by Microsoft. While you have to wait a bit longer for the Anniversary update, Microsoft has released a series of freebies to celebrate the game's first birthday. This includes various cosmetics, the Captain Bones Original Pirate Cutlass, a set of Gamerpics, and discounts. Visit the Xbox Wire to see a rundown of the freebies. Sea of Thieves is available now for PC and Xbox One; the console edition is in the Xbox Game Pass library, which means subscribers get it at no extra cost.